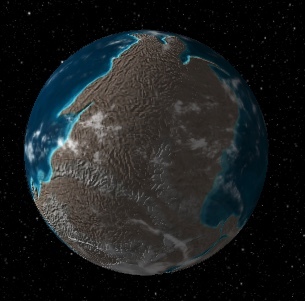 Earth, 600 million years ago. The Ediacaran Period; life is evolving in the sea, and multicellular life is just beginning to emerge. From the good folks who brought you Dinosaur Pictures, a chance to watch continental drift at work– a marvelous interactive model of the earth that you can view from the present to 600 million years ago: Ancient Earth.